Share this pic with friends! the tall ship Hawaiian Chieftain makes her return trip to town. 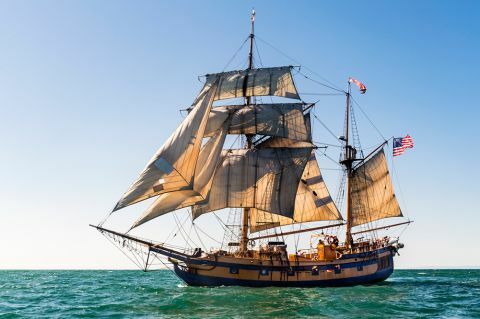 The tall ship, part of the Aberdeen-based nonprofit Grays Harbor Historical Seaport, sails the waters of the Pacific each year along with its companion vessel Lady Washington, offering educational programs, free deck tours, and sailing trips. From November 1st through the 24th, Hawaiian Chieftain will be docked at Old Sacramento, (1210 Front St.). On weekdays schools can reserve a trip aboard the tall ship for the Historical Seaport's one-of-a-kind maritime heritage field trip Voyage of Explorers. On weekday evenings and weekends the tall ship is open to the general public for stationary dockside Vessel Tours for a $5 suggested donation. Hawaiian Chieftain can also be Chartered for private events including weddings and workplace team builders. The steel hulled Hawaiian Chieftain was launched in 1988 in Lahaina, Hawaii. Together with Lady Washington, the tall ships are among the most active educational boats in America, visiting approximately 40 ports each year. The tall ships offer a glimpse into our historic past, introducing people of all ages to the sights and sounds of 18th and 19th century maritime life. Grays Harbor Historical Seaport is an educational non-profit based in Aberdeen, Washington. In addition to school programs and public sailing, the tall ships are also active sail training vessels. Anyone over age 16 is eligible to join the crew through the Two Weeks Before the Mast volunteer sailing program. Those pursuing a career in the commercial maritime industry can also consider enrolling in the Historical Seaport's Sea School Northwest, a job training program to provide knowledge and mentorship for professional maritime fields. If you're ready to run away to sea, or want to know more about the tall ships and their programs, please visit www.historicalseaport.org. The vessel will be docked at Old Sacramento, 1210 Front Street, Sacramento CA 95814. For directions and schedule information, please call (800) 200-5239.